Shopping for an all natural latex mattress or any mattress for that matter doesn't have to be difficult if you have helpful facts, figures, and tips in hand. You've found an excellent buying guide if you're currently shopping for the best latex mattress made from all natural materials! I've put together information here on several retailers, their return policy, warranty, prices, and much more, which I gathered during my own personal research when I went shopping for a latex bed. I've also included pictures of the natural latex samples that some companies sent me, so you can see what they look like! See below for more information about each sample. Which retailer is the best one for buying latex mattresses? These are some of the companies that I looked at. In your own research, look also for any customer comments regarding the company in question - these are very helpful because they're based on first-hand experience. The FoamOrder.com samples we received is on the far right in the picture above, with the numbers 31 for the Dunlop latex sample and 36 for the Talalay latex sample. Return policy - returns must be completed within 90 days of purchase. The mattress must still be in brand new condition and returned in the same packaging and boxes in which it was shipped. Every return must have a RAN, or Return Authorization Number, on the box or else it won't be accepted. Warranty - all warranty claims must be made within 90 days after the mattress is delivered or within 30 days of the date of purchase. A receipt must accompany all claims or else they will be denied. Shipping - mattresses are shipped via United Parcel Service. Free shipping applies to purchases $1,200 and over. Purchases of $900 - $1,200 receive a 50% discount on shipping. In the case of a return, the consumer pays for shipping costs both ways as if shipping wasn't free or discounted. Price of mattresses - Twin mattresses begin around $550 and go up to the California king size around $1,500. Chemical safety - This company offers an all natural latex mattress called NaturalSense, which is made from 100% foam latex with sap from a rubber tree. Customer service - the company was rather slow to respond to our customer inquiries through e-mail and telephone. 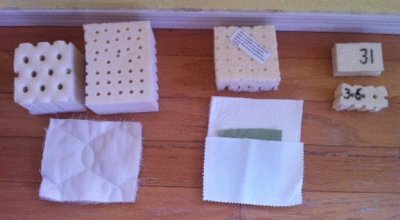 The natural Dunlop latex sample we received is in the middle of the above picture, along with fabric samples that were included. Return policy - any mattress can be returned to the company within 180 days following purchase if so desired. All free items you received with purchase are yours to keep. Warranty - 20 year warranty broken down as follows: you will receive a new mattress within the first 3 years and then for the remaining 17 years, the replacement value is prorated. Shipping cost - in the case of a return, a $75 fee is taken directly from your refund amount. Price of mattresses - twin beds prices begin at $1,199 and go up to California King at a price of $2,699. Chemical safety - Habitat Furnishings imports their natural latex from Sri Lanka, which is supposed to be higher quality latex. During the manufacturing process, this company rinses and wrings out their latex mattresses three separate times with water that is potable so that all latex proteins are removed. People who struggle with contact dermatitis as a result of coming into contact with latex may want to outfit the latex mattress with a protector to avoid any potential reaction. The latex mattresses manufactured via the Talalay process use only latex that is 100% from botanical sources, not the chemical process that uses petroleum. Customer service - easy to order through this company, excellent customer service response, user-friendly website, and free samples available. Saavy Rest offers latex beds that are made in two or three layers, and they are very focused on offering natural, organic and chemical free mattresses. We received two generous sized samples from Saavy Rest which you can see to the far left of the above picture. The Talalay sample is first, and had more of a vanilla smell, and was a bit softer. Their Dunlop sample had less odor than the Talalay, and was firmer, less crumbly and with less odor than the other 2 samples. Return policy - Saavy Rest has a 90 day latex exchange but does not accept returns. Warranty - Saavy Rest offers a 20 year limited warranty and we recommend that you read all the fine print since there are many different ways to void the warranty such as exposing the latex to heat. Price of mattresses - depending on the model and size and ranges from $2109 to $4739 for a queen sized latex mattress, depending on whether you want two, three or four layers of latex, and whether you use Talalay or Dunlop latex for the layers. Customer service - my own experience in contacting this company was excellent. They responded promptly to phone and e-mail inquiries, and sent samples promptly. Chemical safety - Saavy Rest uses organic wook and cotton, and all natural latex in their mattresses with no synthetic or chemical fillers. Their Dunlop latex is certified organic. Return policy - Lifekind will allow a single exchange on a mattress within 90 days of delivery. You must sleep on the mattress for at least 15 days before requesting an exchange. There are no returns permitted on mattresses with Lifekind. Shipping - Lifekind will cover the cost of shipping if defects in the mattress are discovered upon delivery. Price of mattresses - price quotes are given over the telephone or via e-mail. A queen size mattress is in the range of $2,300 and up to give you a rough idea of the cost of Lifekind's all natural latex mattresses. Customer service - easy to order the products, good customer service overall, representatives of company eager to please. Chemical safety - all the mattresses are manufactured in a chemical-free work environment. Lifekind has the only mattress factory in North America that can proudly display the Eco-Factory(tm) label. They manufacture all their latex mattresses with 100% natural latex and use only organically certified materials to finish their mattresses. They even take it one step further - no one in the factory is permitted to wear perfume or body sprays or smoke. They take great care to make sure that no products come through the factory doors that have been produced with chemicals. They'll gladly send you free samples of their latex and their fabrics. No more waking up with numb hands! Look for 100% natural latex and don't be afraid to ask about their source for their latex and what process they use for making the latex foam. Always purchase from a reputable company - a company who has an excellent track record for latex mattresses made from organic or all natural components. The simpler the mattress design, the better the mattress. The warranty should be a minimum of 10 years - a 20-year warranty is best. Obtain samples from the company if possible before making final decisions. Take full advantage of any trial periods offered by the company to see if a latex mattress is truly the right mattress for you. Look around for the absolute best price! Make sure the outside mattress cover is produced from a breathable material - very important so the latex can breathe. Opt for latex mattress construction that features Dunlop latex in the foundational layers and the Talalay layers on the top. Dunlop latex provides good support while Talalay delivers plush, soft, luxurious support closer to the body. Latex mattresses are delivered most frequently via freight delivery companies who will not bring the mattress into your home due to the weight of these types of mattresses. Make sure you have people to help you bring the mattress inside your home and set it up! An all natural latex mattress may be just the right fit for you, but take your time researching the companies and the products to ensure you get the best mattress for your needs. What's Your Favorite Natural Latex Mattress? Which brand is your favorite all natural latex mattress? What do you like about it?